Hmm, mine's an early run Tegiment and certainly shows wear. More dents than scuffs, and nearly all are from rubbing on the inside of the bracelet (so who cares? ), but it still doesn't seem as impervious as a friend's Bremont or even the similar, SUG made Damasko watches. What he said, my U1 looks as good as the day I got it, and I wear it everyday. Try racing Porsches in GT2! nah, too heavy I wouldn't be competitive at over 200lbs And at 6'4, me and roll cages are a bit of a challenge sometimes. I'd agree, they're not as invincible as people lead on. Still I love both of mine. My regular U1's bracelet shows a lot of wear, but its not tegimented. The bead blast finish shows more wear (IMO) versus a brushed or polish 316L case/bracelet. My SDR actually has a strange scratch/mark across the PVD bezel. I was trying to sell it, but it seems no one wants it because of this. I dropped the price to what I consider a bargain and no takers, so I'm just going to keep it and use it as a beater. Scratch on the face, the case or the bracelet? i dunno - i would probably call it the face (clear glass) HAHA !!! i just pulled out a ruler at work and it's a 5mm scratch. there's a smaller one next to it, real real fine though, but it's about 3mm long. it's annoying because i know it's there. i have to squint one eye and look at it in the light so i can see it. I feel you. I'm 220, and if on fire could have made it out the window, but it was easier to have someone pop the top off so I could crawl out the top. The car weighed only 1800 pounds so my extra weight didn't hurt it too much. It dynoed at 325hp to the wheels, and at 1800lbs it was insanely fast. I dove in deep end first, it was too much car for me in many ways but especially financially. As far as places to piss money away though, racing is up there with boats, and watches lol. No doubt. Size can get in the way of fun sometimes... How long did you race for? I rebuilt 2 engines on my boat last year and threw in a couple of performance parts just because the motors were opened up. Two 502ci blocks ended up costing close to 30,000 to do with some hull paint and a few odds and ends, but that was mostly engines running the bill up like that. Buying 2 cylinder heads is bad enough, but 4 is just a new ball game . Sad thing is that I know I saved money using an independent boat mechanic who was ready to make deals.... Probably kept about 10k in my pocket by not going to a performance boat dealer. Now that they are done, won't have to do that again. I'll sell before it comes to that. I drove this car for 4 years. The hardest part was getting people to help, that and the cost of tires. After a while, knowing in the back of my head that if I hurt anything it would be the next lifetime before I'd be able to fix anything. Engine was 35 grand, gearbox was 18 grand, shocks were 12 grand, carbon fiber body, the car was a work of art. One of the most developed, fastest 914's in the world. It ran in GT2R against all the new supercars (and held it's own). I bought it in pieces from the builder (he retired) and put it together in my garage. Luckily the guy was meticulous, and kept immaculate records, so with all the data i was able to hit the track without having to do much development on my own. I was a good custodian for the car, it's now being raced by a hotshot in New Jersey and winning races. Now I have my 135 that I've set up for autocross. Much more casual and affordable. However there don't seem to have been that many watches made with green faces - pink/rose, yes, blue certainly, green - not so much? Rolex milgauss with the green glass. Very subtle green, more noticeable when looking at it at an angle. Or rolex ss sub with the green dial AND bezel. 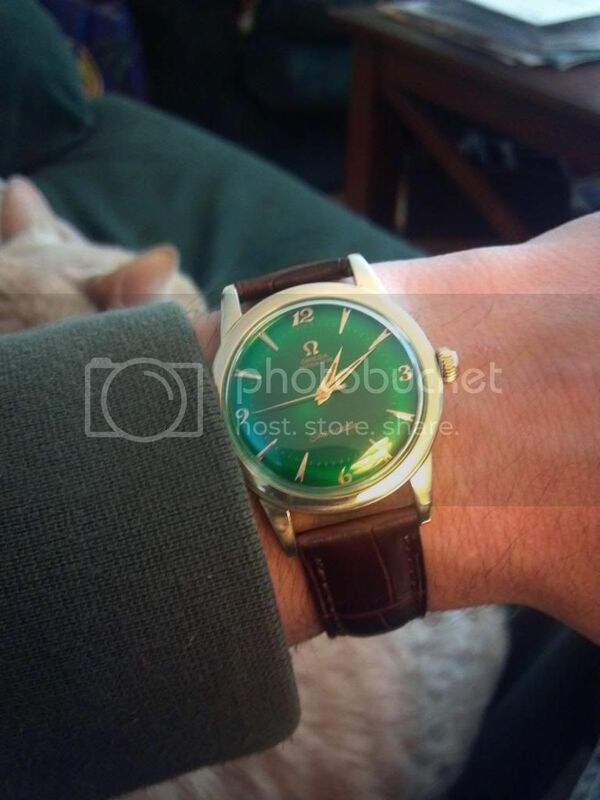 Or the 50th anniversary rolex sub with black dial and green bezel, if you can find one. Damn, you guys have/had some serious hobbies! Getting back to topic, I'm curious what you guys think about these new "smart watches" that will be coming to market. For me personally, I can't ever see myself wearing one and will stick to "old school" watches. I recently saw this article about these new devices, which I found amusing about how they will supposedly make wearing a wristwatch popular again. I've always worn a watch, it's easier to me to look at my wrist than it is to pull out my phone. And I think I too will probably stick to old school watches - it's the one piece of jewelry a guy can wear without looking like a "gold chainer" or worse... My "new" Omega came in the mail yesterday, pics later. Awesome! Which model Omega did you get? 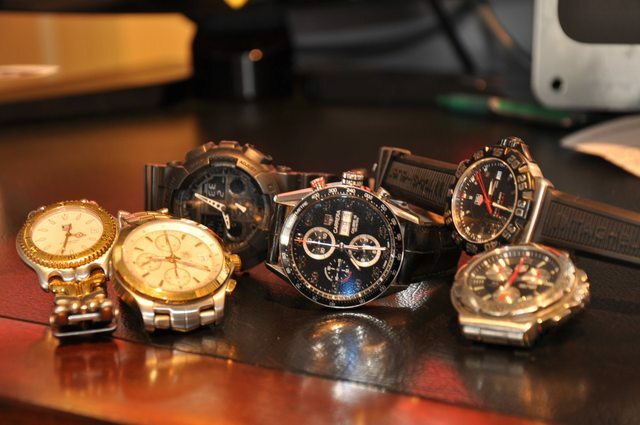 I'm getting close to having enough extra money to get another nice watch. Although, I've been bitten by another bug, and I've been looking into building an old-school Harley Shovelhead bobber, it will be hard to decide as both will be about 15 grand. I think I'll always be an old-school mechanical watch guy, I don't see myself ever wearing anything digi. What I'd like to see is hi-tek sunglasses, soon I bet we'll have the technology to put heads-up displays into glasses so your computer, phone, camera, everything, would be in the glasses. Even better yet, all that put into custom contact lenses. Google has been working on that with Project Glass. I believe developers are already working with some prototypes. I think there's already a heads up display in some ski goggles if I'm not mistaken. Tells you your speed and a few things. I miss my bike.... One day I will have another. New acquisition, complete with small fuzzy friend. Good: dial is gorgeous, and has nice applied markers. Movement dates to 1954 (not 1952 as seller stated, but still.) Keeps time well. Has new Omega signed strap and buckle. Gold is still nice and even on case; isn't over-polished or brassed. But as I said before, I'd always wanted a respectable watch with a green face and this has a very very nice one; pictures can't really capture the very subtle starburst which is quite attractive. I probably overpaid for it, but it makes me happy, so whiskey tango foxtrot. looks nice and clean Enjoy it. And congratulations. i told ya'll that i didn't think this watch thing was going to turn into a fetish, BUT, i just pulled the trigger on this Invicta Reserve Venom Limited Edition Swiss Chronograph.